Dr. Jayson Haws was raised in Bear River City, Utah. He attended Bear River High School and went on to study at Utah State University. He earned his undergraduate degree in chemistry and biology with a minor in Portuguese. He later enrolled at the University of Minnesota, School of Dentistry and graduated in 2005 with his DDS degree. 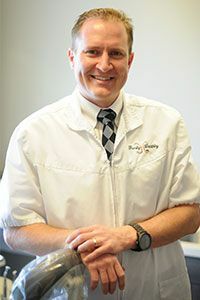 In order to give his patients the best care available, Dr. Haws is committed to adding to his expertise with the latest technology and knowledge in the dental field through continued education. Dr. Haws has also received additional training with continued education in orthodontics and dental implants. Dr. Haws is married and he has four children. When he’s not in our practice, he’s often found participating in four-wheeling and all other sports, especially basketball. He loves the Utah Jazz, music, and enjoys restoring classic cars. Dr. Haws is very personable with everyone who comes into our office. He makes sure that our patients always feel confident and comfortable. He enjoys establishing relationships with all of our patients.